The new iOS 11.2 beta, released to developers this morning, addresses a Calculator animation issue that's been present since iOS 11 was released to the public in September and throughout the iOS 11 beta testing process. In all versions of iOS 11 prior to iOS 11.2, a calculator animation causes some symbols to be ignored when entered in rapid succession. As an example, if you tap 1+2+3 and then hit the equals sign quickly, animation lag is likely to case the result to be 24 instead of 6. 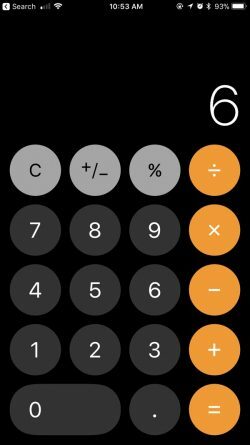 With the iOS 11.2 beta, Apple has removed the animations from the calculator app, so calculations can be conducted rapidly with no need to pause between entering numbers to obtain the correct result. Though the Calculator bug was present throughout the iOS 11 beta testing process, it gained significant attention last week, likely prompting the fix in today's beta. An Apple engineer said dozens of people had filed bug reports about the problem, and hundreds of complaints were lodged on reddit and the MacRumors forums. iPhone users who regularly use the Calculator app should find it to be much more accurate with the slow animations removed. It is hard not to see a bit of humor in the fact the calculator is buggy. The most basic and simple of Apple apps that has been with the OS and iOS since, forever. and it can't even manage to find it's way over to the iPad after all. these. years. Macrumor is our new feedback system! Make more headlines! Still can't understand why they can't (or won't) update individual apps through the App Store. This should've been a quick fix just for calculator app, but now we have to wait for 4-5 more betas before release. Is it just me or has Apples quality control gone out the window??? The calculator app doesn't work now?